$500 vs $5,000 Grills-Whats the Difference? The first choice in selecting a fire pit burner is to decide what gas type is best for the application and budget. Both Liquid Propane (LP) and Natural Gas (NG) burners are available and the burner must be ordered correctly for the type of gas being used. NG is typically piped from the street to a manifold that distributes the gas throughout the house. LP gas is fed from tanks of various sizes which can be above ground or under ground. Smaller 20lb Lp bottles can only support fire pits up to 85,000 BTUs if you want a higher BTU burner you will need to install a larger tank. We recommended that a licensed professional determine the total amount of BTUs (Volume) your gas supply lines will support and also to size and install any gas appliance in accordance with local codes for safety. Once the gas type and volume is known then the ignition, size and shape can be chosen. We offer three (3) CSA Certified Ignition Systems. CSA certification is the highest certification and is accepted by all government agencies that require UL and ANSI stamps. MATCH-LIT burners are the simplest technology and are certified up to 65,000 BTUS. Using a match, the fire is lit and the gas feed is manually adjusted to regulate flame height. PUSH BUTTON SPARK burners are certified up to 140,000 BTUs. Push button spark burners use a battery to ignite the flame and do not require electricity. They have a flame sensing control to turn off the gas should the flame blow out. ELECTRONIC IGNITION or Hot Wire Ignition (HWI) is certified up to 400,000 BTUs. Ignition is controlled from a 120V switch located near the fire pit and may also be controlled by a remote. This automated system includes a flame sensor to detect heat which will shut off the gas should the flame blow out. One awesome thing about HWI is the ability to control the fire pit from a good distance away from the burner, making it safer and more comfortable to lite the burner. Also, HWI is available in a 24 volt system when installations for fire pits are located close to water features. All of the burners that AOK provides come with Stainless Steel pans that hold the burners. The burners are typically 6” shorter than the pan, except for the linear burners with trough pans. These pans sit directly below your burner, to provide support and proper placement for the components. We highly recommend purchasing fire pit burners with the pan and here’s why: •The pan ensures that unburned gas doesn’t puddle below the burner, causing a safety issue and hazzard •They provide a support for your burner ring, ensuring that it is level and mounted at all times. • They drastically reduce the amount of fire pit media required. • Pans also help the water drainage in your fire pit by keeping the burner off the media. Round fire pit burners with round pans are the most common and make a good shape for conversation pits. Sizes range from 12” to 54”. Over the years square pits have become more popular with sizes ranging from 12-24”. There are many other shapes such as linear shape burners that make a dramatic statement. Once a shape is determined it is time to pick the style and size. This will ultimately tell you the shape and size of your fire pit enclosure. The size of the fire pit burner is going to determine the BTUs as well. The larger the burner the higher the BTUs. This is an important step since this will determine how much impact and heat will be given off. Burners that produce less than 75,000 BTUs are generally used in smaller fire tables and premade fire pits. Burners that produce 100-150,000 BTUs produce a nice flame and are usually in the 24-30” range. The burners that I recommend are in the next range between 200-250,000 BTUs and 31-37” in diameter. These burners produce a full flame and give off enough heat to keep you warm on cooler nights. At AOK we carry a full range of burners that are certified up to our 400,000BTU burner. Once a burner has been selected, the size and shape of the enclosure can be determined. This is your chance to get creative…. The Enclosure or the Fire Pit Shell contains the fire pit burner insert. The enclosure can be round, square, rectangular, or linear in shape, custom shapes are also a possibility but can be very challenging to construct. When constructing an enclosure great care should be taken when selecting the location. A perimeter of at least 4 feet around the fire pit is necessary for safe travel and seating. The height of the fire pit can vary, but it is typically a minimum of 18″ from the floor to the top of the burner with the cap of the fire pit above the burner, check the fire pit burner insert clearances before setting the final height. For the frame many building materials are available for the enclosure construction, including cement block, steel and aluminum studs. Use only non-combustible materials. Drainage is very important, so provide a way for the water to escape from the enclosure either by natural means or via central drain. Water trapped in the enclosure or in the media or around the burner is dangerous and will not smell good when the fire pit is lit. IMPORTANT!!! One of the most overlooked features of fire pit construction are the air vents. Air Vents provide ventilation so the proper fuel/air mixture can be achieved. Without the proper fuel mixture the fire will burn too rich creating a gas smell or too lean starving the flames. Equally as important, the vents provide a way for excess gas to escape. Without proper venting, a small leak under a fire pit burner can cause an explosion. Two to three air vents at the bottom of the enclosure in addition to a drain are recommended. Most fire pit burners require 36 sq. inches of venting total for proper venting. Most local codes will require a gas shut off device that is located within 3-6 feet of the pit for emergencies and repairs. Check with the local authorities or your license professional for the exact codes. It is important when constructing a custom fire pit to make sure the fire pan can be easily removed. The pan should never be “locked” into place with mortar or the stone cap. The cap should also be properly spaced from the fire to prevent it from getting too hot, which may cause it to crack or explode. We recommend a 4-6″ space from the outer edge of the pan to the inner edge of the cap with the burner placed at the same level or lower than the bottom of the top cap, this helps protect the fire from being blown out by high winds. The fire pan must be properly suspended without media or filler beneath. The area under the fire pan should be open to allow for air to enter through the vents. 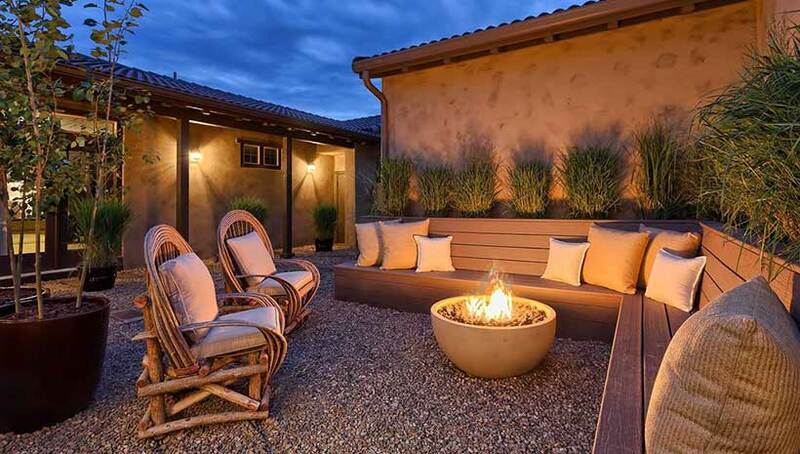 Fire pit finishes must be made from a non- combustible material such as Stone, Stucco, Brick or Tile. There are also copper bowls and many other pre-made enclosures to choose from. The Media you choose to cover the insert has a significant impact on both the overall look and impact of the fire pit and how the flame behaves. Lets look at some of the choices below and their characteristics…. It is important to use media that is designed for fire pit use, using stones and materials not designed for high heat can explode and create shrapnel. DECORATIVE FIRE GLASS – For a more contemporary look, Comes in a lot of different colors and sizes. For best results use 3-4″ to cover the burners. Note: AOK doesn’t recommend using glass over another media such as lava rock. Lava rock must be able to breath and allow the moisture to escape, using glass or another media over the lava rock can cause the moisture to be trapped in the lava rock that can produce steam that can expand and lead to explosions. LAVA ROCK – Used alone or as a base for outdoor fire logs. Lava rock is proven to increase performance but will break down over time. ROLLED LAVA STONE – Give you fire pit a oriental look. Lava stone can also be used around the burners and then combined with Lava Rock for a really cool look. RIVER ROCK – Lightweight ceramic stones “gel cast” and designed for outdoor exposure. comes in different colors. OUTDOOR FIRE LOGS – Made of gel cast ceramic fiber, log sets will glow red where the fire is hottest and radiate the heat outward for the warmest fire pit.